As you will be able to tell, this show falls in the Di’Anno era, of which the only official video release was the six song “Live at the Rainbow” from 1980, which left fans clamouring for more. (Yes, I am aware of the 1980 show on Disc 2 of The Early Days but given its status as a curiosity due to its terrible quality, I’m ignoring it for the purpose of this review). As a side note, while the original six-and-a-half song broadcast of this show has been available as a bootleg for quite a while, this is the full twelve song show (and a little more), without the visual effects of a degrading VHS either. Unfortunately, the audio and video are just ever so slightly out of sync. 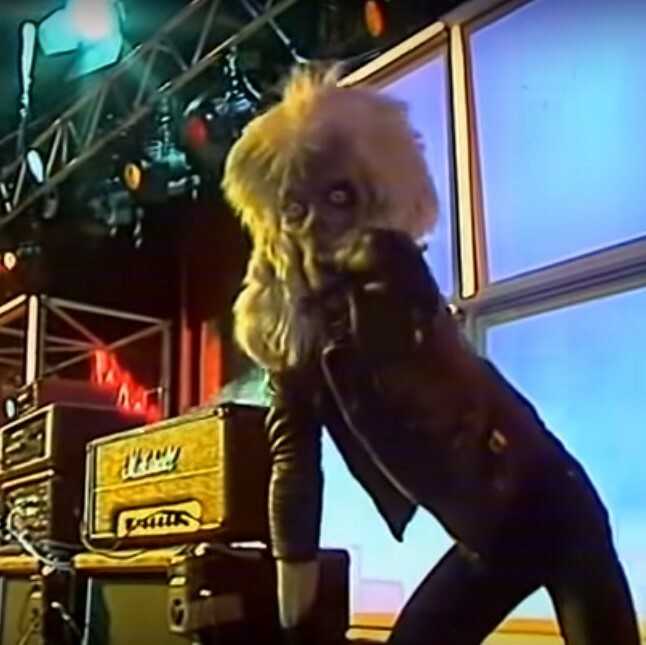 The performance commences rather uncharacteristically with “Prowler” following “The Ides…” instead of the quintessential “Ides of March/Wrathchild” combo, although this was well known as “Prowler” opened the original broadcast as well. 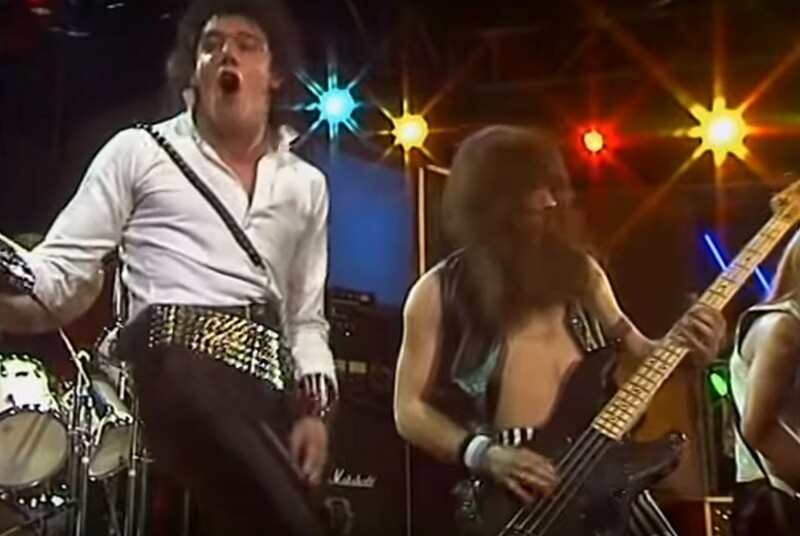 With Paul Di’Anno and Clive Burr both in fine form, “Prowler” doesn’t get much better than this. 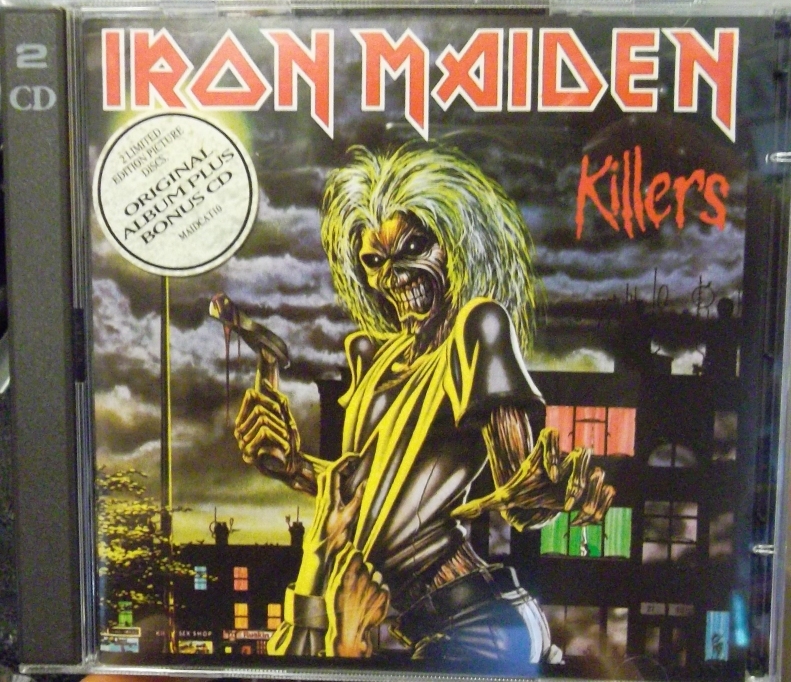 Next up however, is something that did not feature on the original broadcast nor features on any Maiden video since: one of my favourite songs from the debut, “Charlotte the Harlot”. It becomes clear here, as the band kick the energy up to 11, of the great hindrance that Wil Malone’s production on the debut was. Steve Harris is right. It didn’t even begin to capture their ferocity live. Thankfully this mix rectifies that error, and this song is a definite highlight of the show, no mean feat in a Maiden performance. Another broadcast song, “Wrathchild” follows on, with the honour of being the first song of the show from their then unreleased second album. An awesome rendition of the enduring Di’Anno era classic, there’s not much else you can say about any of Maiden’s performances of this song. On the other hand, there is much to say about the performance of “Remember Tomorrow”, except, not much of it has to do with “Remember Tomorrow”. During the second verse there’s a most interesting sound coming through: the sound of a technical failure, and the band stop playing soon after, having a beer and mucking around with their guitars as the problem is fixed. I’m so glad they left this interlude in. It shows a little bit behind the scenes and is a nice deviation from the main stuff, one that is not often shown, even on these full show sorts of things. Eventually someone decides to stop using up tape, and we cut to the start of the second go at “Remember Tomorrow”, which is done by the numbers in spectacular Maiden fashion. With things definitely back on track the band plough into “Transylvania”. When it comes to instrumentals, Maiden really knocks it out of the park, and I do wish they’d done more. This performance is no exception, although I do think I might prefer “Genghis Khan” from Killers. Now, despite being one of their few singles at the time, “Running Free” didn’t make it onto Live at the Rainbow. This travesty thankfully does not reoccur here, and while Live After Death boasts the ultimate “Running Free”, Di’Anno and co. are no slouches and that’s reflected in probably one of this line-up’s best performances of the song. Another Killers song, “Innocent Exile” is next. It’s done well, and as this is before the era of the twig-snapping bass tone, you get a nice full little bass workout from ‘Arry as the intro. “Sanctuary” comes next. It’s one of my least favourite Di’Anno era songs and I fully believed it outstayed its welcome on subsequent tours. It’s not the best rendition either: Di’Anno mixes some lyrics up and the solos are not up to the usual standard. Now here’s something interesting though: “Killers”. This show was recorded only 11 days before that release of Killers, yet this version of “Killers” is the most experimental I’ve ever heard it. The intro and the guitar harmonies have a spacey feel to them and there’s even the changing up the lyrics for a couple lines. Di’Anno’s screams being mostly absent for most of the intro only accentuate this experimental vibe. It’s nice to have a good quality video now of the album lyrics (most of them anyway). “Another Life” is the next song, one that was fade-cut halfway as the credits rolled on the original broadcast. Now it’s here in all its glory: a good, if perhaps almost filler song from Killers. It’s a fiery rendition, but it suffers from “If you’ve heard it once you’ve heard it three times”. The drum solo is sadly but expectedly skipped on this show, pushing this good, if unspectacular song into the background. This slight lull in awesomeness is immediately rectified with “Phantom of the Opera”. The original Iron Maiden epic, it was played at breakneck pace at the Rainbow show and it’s not much slower here, a slight shame because “Phantom of the Opera” is one of the few songs I think isn’t better when done faster. That being said, it’s still a chunk of pure awesome no matter how you slice it. This year is the 20th anniversary of the 1998 remasters. The 1983 live album and video Alchemy by Dire Straits is a prime example of this. It has terrible lighting, being way too dark most of the time. But then again, most landmark live albums don’t have video components anyway, so we should be grateful to have any sort of video of Alchemy in the first place. Although when it comes to picture quality verse age, you can’t beat Deep Purples Granada 1970 performance. Don’t even get me started on the video of The Rolling Stone’s Live at the LA Forum 1975. Complete waste of valuable high-quality film. The only Dickinson rendition of this song I think is truly awesome is the Beast Over Hammersmith one. Good write up, but I disagree 1005 about Running Free being better on Live After Death. Bruce’s voice is just too operatic to sell Di’Anno’s lyrics. Clive>Nicko too. I’d also say Another Life is better than filler too. I love those early Maiden shows. They’re so hungry and powerful, not content with just writing a bunch of “progressive” songs that are comprised of the same 4/4 riff with a bridge repeated twice to shake things up. Harrison is #1. And yeah I was probably too harsh on Another Life, Killers is in my top 5 Maiden but I tried to be a bit objective when reviewing. You and I are in the some boat with Killers. We have to convince LeBrain of its perfection. I wish Iron Maiden would release the album they did with George Michael. I mean, they toured with him in the time between Bayley and Dickinson’s return. I went to one of those shows. They opened with Wake Me Up Before You Go Go. All the band members were wearing the Choose Life outfits from the music video, with Janick being the only one that moved as much as George. It was beautiful when Janick busted out the saxophone for when they played Careless Whisper in the encore. George Michael still does the definitive version of Prowler. This is from the same universe as The Shining review! It was also great when Rick Astley subbed for Ripper Owens before they got Halford back. The medley they did of Never Gonna Give You Up and Dissident Aggressor was to die for. In all seriousness, Priest did record three songs with Astley’s producers Stock Aitken and Waterman. “You Are Everything” has been leaked in part. This happened around 1987-88, the Ram It Down era. Yeah, I’ve heard that song. I think the Stock Aitken and Waterman connection is what ultimately got Rick into the band. Thank you Harrison for this in depth review! It is obvious that you care deeply about the details. This has been your best work that I’ve read. The fact that we can now watch this for free on Youtube whenever we want…it’s unbelievable. Such a thing couldn’t have been fathomed when I was buying Maiden bootlegs 25 years ago. Thanks, I pulled out all the stops on this one and I really enjoyed writing it. I have noticed however that I chronically overuse the word “rendition”. Everything Lebrain said in his comment (above)! Up the irons!